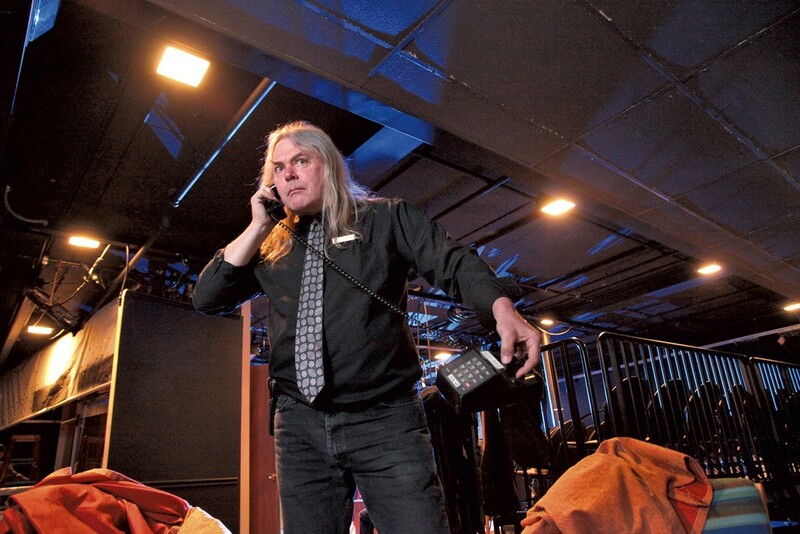 If you've ever been to Burlington's FlynnSpace, you've probably encountered Brian Johnson. The manager of the subterranean venue is often behind the bar, serving up drinks and snacks. He cuts a memorable figure: tall with shoulder-length graying hair and eyebrows that have a life of their own. But Johnson offsets his physical stature with a wry sense of humor, one that seems to teeter between amusement and forbearance. This is a man who's in on the Great Cosmic Joke. In a couple of months, Johnson will pour his last glass — make that nonbreakable plastic cup — behind that bar. No more will he suggest you unwrap your candy/nuts/pretzels before the show so you don't make that rude crinkly sound during a performance. Johnson, who gives his age as 62 and a half, is retiring after 15 years managing the FlynnSpace and 21 years working for the Flynn Center for the Performing Arts. He's going out not with a whimper but a bang. And crashing cymbals. And booming timpani. Johnson is not just that guy behind the bar (or sometimes behind the sound and light board); he's also a master percussionist. Trained at the Hartt School, he's played with the Vermont Symphony Orchestra for more than 20 years. He's freelanced with classical and contemporary ensembles, toured internationally, and written and performed numerous solo compositions. So his parting gesture is a concert this Friday at — where else? — FlynnSpace. Johnson calls his show "The Percussion Section: Non-Traditional Music for Traditional Instruments." Don't let the bland title fool you. Johnson's hero in sound making is minimalist John Cage, a preference reflected in the second piece — of 10 — on the program, Cage's "Composed Improvisation for Snare Drum." But Johnson, along with guest percussionists Tom Goldstein of Baltimore and Jeff Salisbury of Vermont, will give Cage's work a twist: Each will simultaneously play "individually prepared realizations of the score." "The snare drum is the rhythmic chatterbox of the orchestra," Johnson states. This would be a good time to make your crinkly noises, because no one will hear you. The Cage piece has never been presented this way before, making Johnson's performance a de facto world premiere. So is Johnson's own composition "For Concert Bass Drum and Large Crash Cymbals." Also on the bill are multimedia pieces such as "Timps in E" by minimalist composer Phill Niblock, which will be accompanied by film from Niblock's The Movement of People Working series and recorded audio tracks by avant-garde percussionist Jan Williams. After an intermission to clear the ears, the second half of the show will combine percussion and spoken word, with "my poems and Lawrence Ferlinghetti," Johnson explains. Saxophonist Brian McCarthy will perform on the final piece, which shares the title of the Ferlinghetti poem "Junkman's Obbligato." Originally published in 1958 in a collection titled A Coney Island of the Mind, the "Obbligato" is one of seven poems that were intended to be "oral messages" with jazz accompaniment, Johnson says. Because the music is different each time, the poems "are still in a state of change," he writes in his program. The poem's performance in this concert has symbolic value for Johnson. "It talks about 'we're going, we're splitting and we might never see you again,'" he says. It's a fitting farewell for a guy who's contemplating a move to Ecuador. Why that equatorial country? "I've got a nest egg, but it's not an ostrich egg; it's a hummingbird egg," Johnson explains. "I started doing research about living in other countries where money goes farther and it's safe." He's also considering Southeast Asia or even hopping from country to country, one three-month visa at a time. Clearly, Johnson is ready for an adventure. Not least, "I'd like to get above ground for a while," he quips. This summer, Johnson will fix up a cabin on a friend's property in the Adirondacks. "Then I'll come back [to Vermont] in the fall and try to figure out what to do with my stuff," he says. That stuff includes a mobile home, in a tidy park in Cambridge called Highland Estates; and zillions of percussion instruments, including some he made himself. Johnson likes the idea of selling the entire 45-year collection to a young percussionist just starting out. "All or nothing," he stipulates. "I'm not going to sell it piecemeal." Duly noted. Aside from his VSO gigs this year, Johnson appears ready for his musical — and FlynnSpace — coda. "I'm kissing show biz goodbye," he says. "I've done it my whole life. It's a wonderful thing, but I've had too much candy." The original print version of this article was headlined "Greatest Hits: Percussionist Brian Johnson Prepares His Finale"